Young sporophytes of Saccorhiza dermatodea and Alaria esculenta cultured from Spitsbergen isolates were exposed in the laboratory to either only photosynthetically active radiation (PAR) or to a spectrum including UV-radiation (PAR+UVA+UVB) by use of cutoff glass filters. The plants were grown at 8±2°C and 16:8 h light–dark cycles with 6 h additional UV exposure in the middle of the light period. Growth was measured every 10 min using growth chambers with online video measuring technique for 18–21 days. Tissue morphology and absorption spectra were measured in untreated young sporophytes while tissue chlorophyll-a content and DNA damage were measured from treated thalli at the end of the experiment. Under UVR, growth rates of S. dermatodea were significantly reduced while A. esculenta have a potential to acclimate. Tissue chlorophyll-a contents in both species were not significantly different between treatments suggesting that these algae may acclimate to moderate UVR fluence. Higher DNA damage in S. dermatodea effectively diverted photosynthetic products for repair constraining growth. Tissue optics (opacity and translucence) was correlated to the tissue absorbance in the UVR region characteristics of phlorotannin, an important UV-absorbing compound in brown macroalgae. Growth rates of sporophytes of both species exposed to PAR without UV was similar during day and night. The results showed that both species can recruit and inhabit a similar coastal zone when appropriate strategies are expressed to minimize damage in response to the stress factor. The first author is supported by a scholarship from the German Academic Exchange Service (DAAD). We thank A. Gruber for collecting field materials and C. Daniel for pigment analysis. 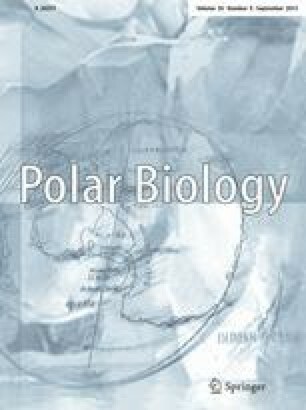 This is publication awi-n 14975 of the Alfred Wegener Institute for Polar and Marine Research.